Editor’s note: This is an updated version of a story we previously published in June 2015. Redistricting the U.S. House of Representatives is not a unified, national process, unlike most national legislatures. Rather, it’s the result of cumulative actions taken by individual states. Nevertheless, it is useful to look at the entire House to see how the decisions in the states combine to form a fair or an unfair playing field for the parties. The most commonly used method for analyzing the partisan nature of the redistricting process is the seats/votes relationship. For this analysis, a simple regression is used to relate the percentage of the two-party votes that the Democrats received to the percentage of the seats they won. The Pearson’s R2 tells us how strongly the allocation of seats is related to the votes received by each party. The slope of the regression line is called the swing ratio, and tells us how responsive the system is to changes in the vote. One can determine partisan bias by simply solving the regression equation for the situation in which the Democrats received 50% of the votes. At that level, they should also receive about 50% of the seats if the playing field is level. Determining the percentage of the two-party votes received by Democratic candidates for the House requires attention to two questions. The first question is how to count elections in states that have majority vote requirements with runoff elections after November, and elections in which all the candidates in the November general election are in the same party, as can happen in the jungle-primary system used in California. If the candidates in the final election were both in the same party, I counted the contest as unopposed for that party. A second question is what to do with these unopposed contests. I define an opposed contest as one in which there was both a Republican and a Democratic candidate in the November election. If the vote in unopposed contests is included, the total for the party that had the most unopposed candidates is inflated, because their opponents would have received at least some votes. If the vote of the unopposed candidates is excluded, the vote of the party with the most unopposed candidates is understated because unopposed candidates would undoubtedly receive a substantial majority of the votes if they were opposed. One way to deal with this problem is to substitute the vote of some other set of candidates in districts where the congressional candidate is unopposed. But on a nationwide basis, the only office available for that job is the presidency, and that is only available in half the congressional elections because House seats are contested every two years while the presidency is contested every four. Moreover, this is exactly the wrong office to use, because here is great variation in presidential and congressional voting. Votes for U.S. Senate or governor could be substituted into unopposed races, but this also has problems. Voters typically know more about candidates for these offices; only 33 or 34 of the states have a Senate election in any year; and nearly all governors now have four-year terms. The two-party voter turnout in unopposed districts is assumed to be equal to the mean turnout in opposed contests. This is designated as “m” in the formula. 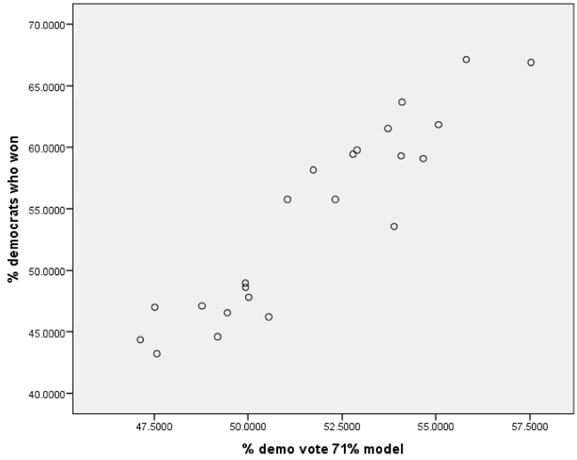 Gary Jacobson of the University of California, San Diego estimates the percentage of the vote that we would expect unopposed candidates would have received, on average, if they had been opposed (v in the formula) at 71% with a standard deviation of 10%. His analysis is based on the support that congressional candidates received in the election following or preceding the one in which he or she was not opposed. With this calculation I derived the percentage of the two-party vote that the Democrats received in recent elections. 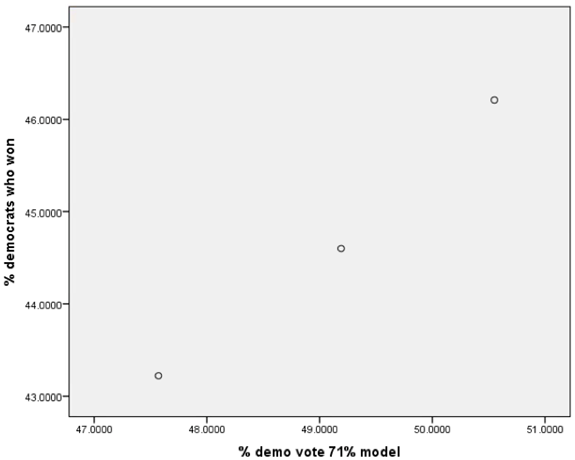 These figures deviate little from other measures of the “total vote” without this adjustment. Over the years I have collected the data from a variety of reliable sources, most commonly the Clerk of the U.S. House. The data for 2016 comes from the Cook Political Report. The logical place to start the analysis is with the 1972 election, which is the beginning of the first redistricting cycle after the U.S. Supreme Court required congressional districts to be one-person-one-vote. In the period from 1972 to 2016, only in 1996 and 2012 did the party that received the most adjusted votes fail to receive the most seats in the House. In 1996, the Democrats received 50.02% of the two-party vote (adjusted), but failed to retake the House from the GOP. In 2012, the Democrats received 50.6% of the two-party vote, but again failed to retake the House. Given the power of incumbency, the “out” party may need to get well over 50% of the two-party vote to take over the house even if there is no gerrymandering. The Republicans received 54.5% of the two-party vote in 1994 to take over the House, and the Democrats took it back in 2006 with 53.9%. The Republicans took it back again in 2010 with 52.9%. 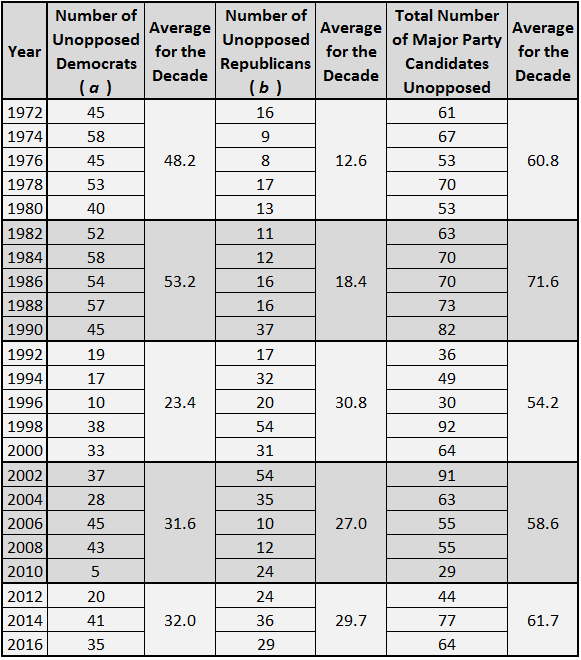 Table 1 shows the number of unopposed contests for both parties in each election since 1972. In general, the party with the most momentum going into the election period had the largest number of unopposed contests, as one would expect. The number of unopposed Democrats has been going down as the Republicans first became competitive in the South and then became dominant there. The number of unopposed Republicans has been going up over time mainly as a result of those same changes in the South. It is reasonable to count the nine elections in California in which Republicans failed to advance to the general election as unopposed Democratic districts for my calculations. If the Republicans are so weak in a district that no Republican can survive the jungle primary, then it is reasonable to count that district as being similar to other districts in which there is no Republican candidate in the general election. None of these elections in 2016 were the odd result of a jungle primary in which the Republican vote was split between a large number of candidates allowing two Democratic candidates to survive the jungle in a Republican-leaning district. In 2016, both parties had about the same number of unopposed contests: 35 for the Democrats, and 29 for the Republicans. In this situation, my adjustment procedure makes little difference in the Democratic percentage of the two-party vote. Note: *Preliminary figures with only three data points. Table 2 shows the correlation, slope, and bias figures for the entire period and for each recent redistricting cycle. Figure 1 shows a scatterplot of this relationship during the entire period from 1972 to 2016, while Figure 2 shows the relationship during the 2012 to 2016 period. The Pearson correlations indicate that the allocation of seats is consistently related to the votes cast. 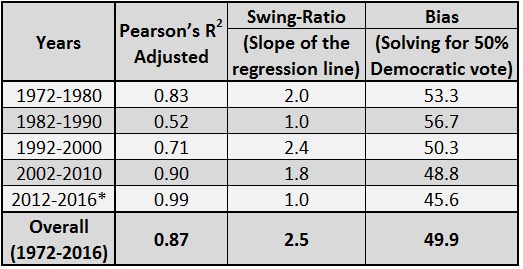 For this entire period the swing ratio has been appropriately at or above 1.0, indicating adequate response to changes in the vote. Over the entire period, the system has had little partisan bias — a Republican advantage of only 0.1%, which is perhaps an additional one seat if the vote were evenly split. However, in the 1970s and 1980s, the Democrats had a sizable advantage, while in more recent elections this advantage has shifted from a very slight Democratic bias in the 1990s to a somewhat larger Republican advantage starting in 2002. Thus, the overall fairness statistics disguise substantial variation over time. The 2012-2016 elections show an enlargement of this Republican bias. If the vote were evenly split, the Democrats would get only 45.7% of the seats on average (199 seats out of 435). This pretty well describes what has been happening during this decade. In 2012, the Democrats received 50.6% of the votes (adjusted), but only 46.2% of the seats. In 2014, the Democratic percentage of the adjusted votes declined to 47.6%, and they won only 43.2% of the seats. In 2016, the Democrats did slightly better with 49.2% of the votes, but still won only 44.6% of the seats. Some mid-decade redistricting (especially in Virginia) seems not to have affected the overall pattern for the current cycle. The Democrats would need to get 55% of the adjusted vote to win a majority of the seats, and that may not include any additional vote that would be necessary to overcome the larger number of Republican incumbents. This level of Democratic dominance is unlikely but possible. The Democrats received more than 55% of the adjusted vote only in 1974, 1976, and 1982. The 1974 and 1976 elections were reactions to Watergate. The 1982 election was a reaction to the Reagan conservative administration. Perhaps a reaction to the Trump presidency might give the Democrats the lift they need to retake the House. The more recent Republican advantage may be due, in part, to the requirements of the Voting Rights Act (VRA) to create majority-minority districts, thus artificially packing the most reliable Democratic voters in a few districts. The high point of this requirement, however, was in the 1990s, when there was almost no partisan bias. Thus the VRA is not inconsistent with unbiased redistricting or even a pattern that has a small Democratic bias. To some extent, the bias may derive from the way in which Democratic and Republican voters are concentrated geographically, and not with the implementation of the Voting Rights Act per se. The power of incumbency also helps the Republicans in the post-2010 period when they have most of the incumbents. It is clear, however, that one cause of the current bias must be gerrymandering in several large states by Republican state legislatures and governors in the redistricting cycle following the 2010 census. 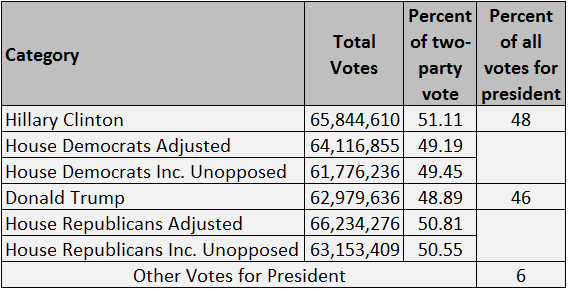 Table 3 compares the vote of the major party presidential nominees to the adjusted and unadjusted vote for the major party candidates for the U.S. House. Hillary Clinton ran well ahead of Democratic candidates for the House. Looking only at the votes actually cast for the House (i.e., without adjustment), she led the ticket by over 4 million votes. Adjusting for unopposed contests, she leads the adjusted House vote by over a million and a half votes. On the other hand, Donald Trump ran about 200,000 behind the votes actually cast for Republican House candidates. The Trump vote was more than three million votes short of the adjusted Republican vote in the House. President Trump has no evidence from these data that he was responsible for the Republicans’ continued majority in the House. One could even speculate that he was responsible for the small net loss the Republican suffered. The Republicans in the House retained control without his help, or possibly in spite of it. Given that straight-ticket voting seems to have become more prominent in recent years, the gap between the Clinton and House Democratic vote is interesting and suggests some lines for further investigation based on polling information. But few definitive conclusions can be reached from these kinds of data, as a multitude of possible interpretations are possible.